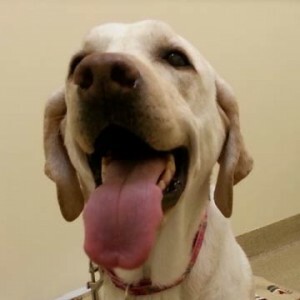 Tripawds Community member janelledv is recipient #51 of the Maggie Moo Fund for Tripawd Rehab. Read on for details about the benefits of canine rehabilitation for three legged dog Zola. 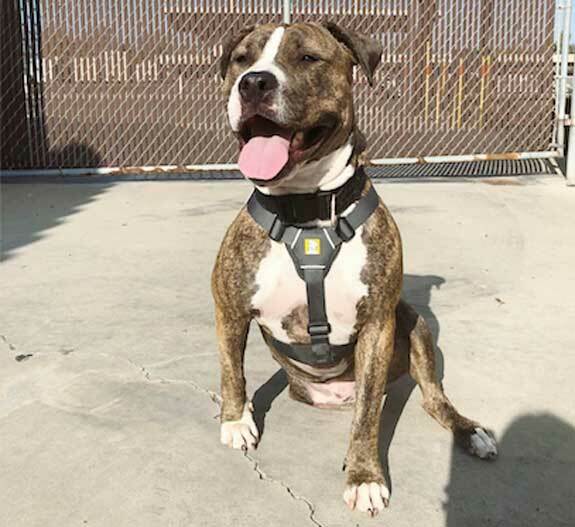 My Tripawd is named Zola, she is a 2 year old American Staffordshire Terrier. Zola was given to us by friends who have her parents and had an accidental litter. Zola has been through a number of surgeries this year, the most recent being a leg amputation surgery. 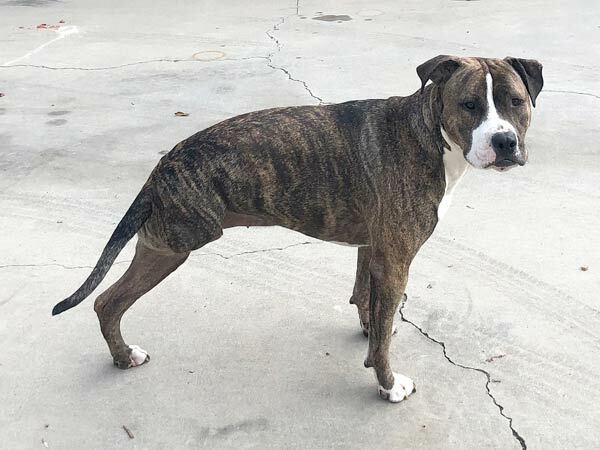 In early March of 2018 Zola was diagnosed with a torn ACL on her right rear leg. Unfortunately, we were not able to afford the cost of the surgery out of pocket. We were 2 months short of reaching our 1 year pet insurance policy that would cover the surgery cost. As a result, it was considered a preexisting condition that would not be covered. We were recommended by several friends to opt for surgery in Mexico. We began our search for a vet in Mexico and through familial connections found one. Everything went well, but 2 months post op we were very concerned with Zola not being on track with her recovery and consulted with an orthopedic surgeon. The surgery in Mexico resulted in a failed surgery, a surgery to correct the torn ACL again, a severe infection that we could not clear as a result of the failed surgery, and a leg amputation in order to prevent the infection from spreading. Going to the rehabilitation consultation was very eye opening for us. Zola was evaluated by Dr. Jessica Waldman at California Animal Rehab. (See all Tripawds CARE articles and videos.) We were able to understand more of what Zola is physically going through and what we can do to help her gradually get stronger. We went over Zola’s medical history, along with her day to day activities and diet. The doctor assessed her and went ahead with an acupuncture session as well. Jessica let us know to lower Zola’s food intake, less weight would mean less stress on her joints. She also addressed several issues with Zola, beginning with her lower back pain, she also pointed out her inflammation and pain on on her legs, primarily her rear left leg. She has a very small range of motion in that leg and recommended several exercises that would help gradually get us to our next stage. Zola’s at home care plan recommends we do the following exercises 2-3x a day followed by icing her rear left leg knee, lower back and if time permits front legs as well. The more icing the better it would be to lower swelling and relieve pain. Gentle spinal/back massage. Gently using finger tips and slowly massaging down to lower back to increase circulation. Gently pull down tail from the base for 10-15 seconds and slowly release to help stretch out her spine for spinal decompression. Releasing very slowly. PROM exercises (Passive Range of Motion) – very minimal due to the low range of motion Zola has in her rear leg. They taught us to make sure we understand and look for any reactions to pain or discomfort while performing these. Leg extension- 5-10x, 5 seconds. While eating, gently tap on chest to shift her weight to the back in order to help with balancing. With treats- move treat slowly in the direction of her tail following it from one side to the other. 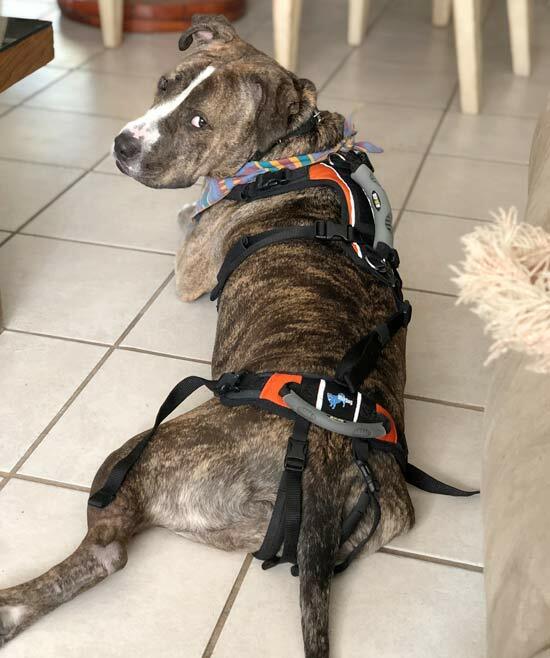 It was also recommended to us to use a “Help Me Up” harness, I have included a picture with Zola wearing the harness for you take a look at it. It contains a harness in the front and a small harness in the back with a handle to help support her posture, balance and alleviate the tension on that rear leg while walking. Other recommendations included taking daily Gabapentin to alleviate chronic pain and help her long term. She was receiving bi weekly injections of Adequan and they recommended weekly. We left the center feeling so good about all the information we received, we have created a calendar with Zola’s daily medication intake as well as exercises needed and have stayed on top of her physical therapy. I heard about Tripawds through online research and I am so glad I happen to stumble on this website, the community support and the discussion forums have been amazing to read through. We really hope to continue to connect with everyone in the Tripawds community.